VAL (2005-2007), the mounted specimen in wing stretch posture, with former habitat in Roberts Bay in background. 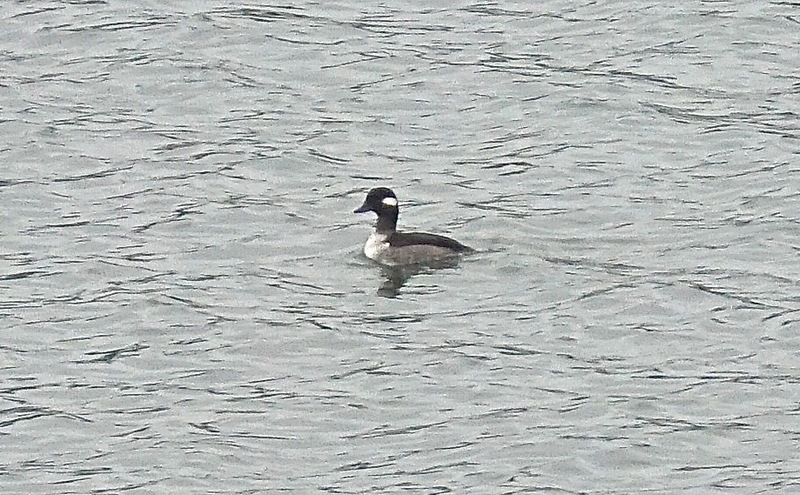 Like most wild birds, Buffleheads are difficult to tell apart. However, if anything, it’s the females that show the most variation in their plumage, occasionally allowing individual identification. Yearling males, which are often considered indistinguishable from females in the field, also show considerable variation though their patterns change as moult progresses. Therefore, it’s difficult to study individual behaviours and the complex social structure of Buffleheads. (They are monogamous and return with high fidelity to their summer and winter residences. ). Once in a long while, however, a distinctive individual shows up, permitting the field biologist to make hay, so to speak, by logging their every movement and dive. That was the case with VAL, a distinctive female who I was fortunate to observe over three winter seasons from November 21st, 2005 to December 15th 2007 (when she was accidentally killed by the resident “Burgomeister” gull). VAL was outstanding, even at hundreds of metres, by her bright breast and large cheek patches, but it was her broad wing patch that clinched her identity. I was able to watch her every day, at any hour from the comforts of home, and over the years I recorded hundreds of her dive cycles and plotted her positions with a surveyor’s theodolite. In addition to her unique appearance, VAL could also be identified by her rhythmic dive cycle, averaging 35.2 seconds in mid-winter, with a ratio of 8.78 up : 26.4 down, within a very narrow statistical variation (+/- 1.4), such that she was underwater 75% of the time. VAL was like a metronome, or as her French vernacular (now lost) suggests – La Marionette. I calculated that she could be undertaking between 918 and 1058 dives a day, and that her total time spent foraging underwater was somewhere between 36 – 45 days over the season. Multiplied by the bottom foraging time of the entire winter flock ( averaging 170), over about 37 hectares, it’s apparent that Buffleheads have a very close, work-intensive, relationship to the particular habitats, within the natural boundaries of this productive environment. Because of their small size and the intense energy demands of working so hard in a cold environment, Buffleheads have evolved into champion divers. 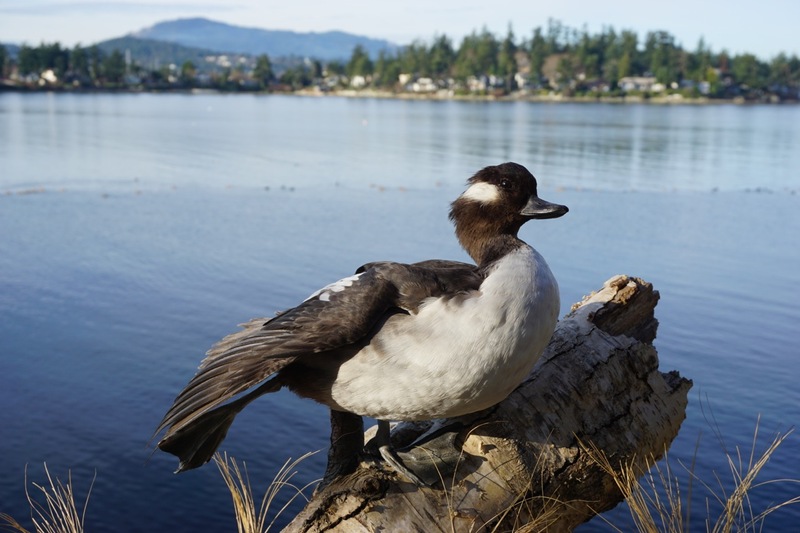 VAL2 taken at long range on Roberts Bay, January 11th, 2015, showing her “epaulettes” where the chest feathers overlap the wing fold. Her cheek patch also has a distinct trailing notch evident in certain postures. I’m excited this year to have found a study replacement. Initially I coded her VAL2 on Excel but she’s not like the old VAL in appearance, being more nuanced. Maybe I’ll re-assign her PAU for Paulette because she has notable “epaulettes” of white ;-). See photo at bottom. Although her dive cycle is almost identical to VAL(erie), and her dive patterns very localized, her daily movements are wider. She has revealed many new secrets. 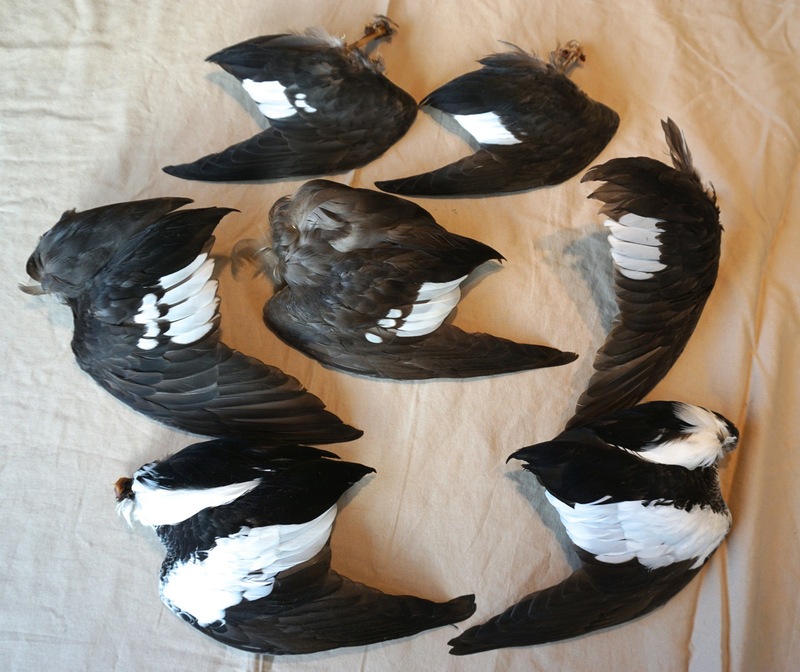 Wing samples of female (top rows) and adult male Buffleheads obtained from predator kills ( Otter and Eagle) on Roberts Bay. 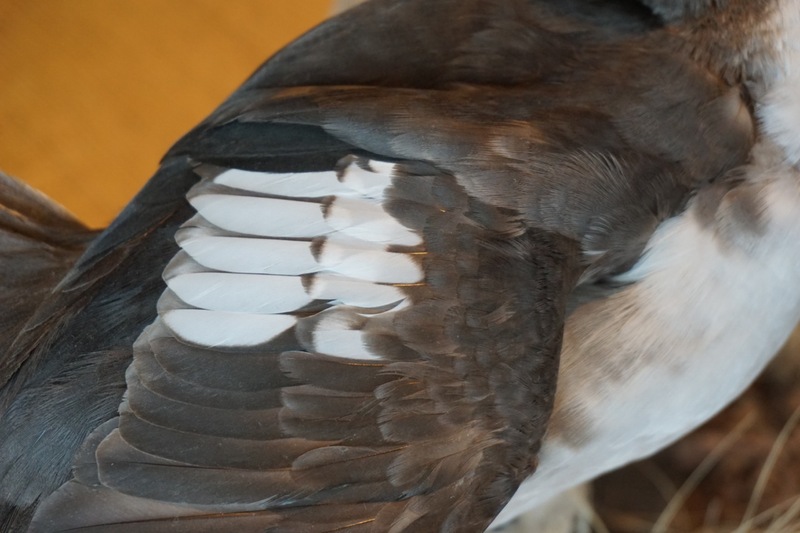 The extent of white in the wing speculum is thought to be a badge of identity, maturity, and status. VAL’s double, five-bar wing “badge”.